I ended up buying a Pool Rover Plus from Costco. The plus model is designed for in ground pools. It can climb walls, if the angle between the wall and bottom is not too sharp, and can go from the deep to shallow end. So, in my pool, it climbs the side and deep end walls, but it can't climb the shallow end wall. It does not work as well as my old basic aquabot did. It goes "too fast", fast enough so it kicks up dirt sometimes, instead of picking it up. The aquabot was snail slow, but it picked up everything in its path. The rover misses stuff. So, at the end of its 2 hour cleaning cycle, there is still a little dirt and stuff in the pool. The aquabot took overnight, but the pool was spotless when it was done. It also slows down as it picks up more dirt, since it uses the pump motor for drive, and as the filter bag gets dirty, the water flow slows down. Since I keep my pool covered, it does not get that dirty, and while it is slower, it still covers the pool. But, I decided to keep the rover. Costco had a sale, and it was $400 shipped, about 1/2 the price of the cheapest bot. And, the most expensive part to replace is the pump motor, which is about $150, so it will be cheaper to repair and keep running. So, while it has its drawbacks, when I weigh the advantages of lower price and cheaper repair costs, the advantages outweigh the drawbacks for me. 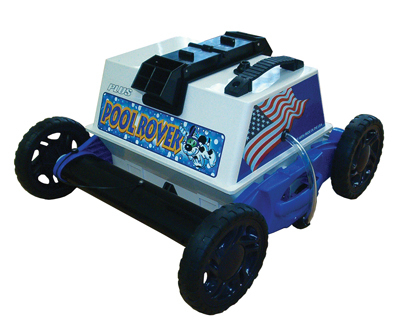 does anybody have a pdf of the manual for a pool rover plus? Randy, this is a terrific review. Most ibformative.